This article is about the U.S. WWII Liberty class naval cargo ship. For ships named "Liberty", see Liberty (ship). For the Liberty ship's successor, see Victory ship. In 1936, the American Merchant Marine Act was passed to subsidize the annual construction of 50 commercial merchant vessels which could be used in wartime by the United States Navy as naval auxiliaries, crewed by U.S. Merchant Mariners. The number was doubled in 1939 and again in 1940 to 200 ships a year. Ship types included two tankers and three types of merchant vessel, all to be powered by steam turbines. Limited industrial capacity, especially for reduction gears, meant that relatively few of these ships were built. In 1940 the British government ordered 60 Ocean-class freighters from American yards to replace war losses and boost the merchant fleet. These were simple but fairly large (for the time) with a single 2,500 horsepower (1,900 kW) compound steam engine of obsolete but reliable design. Britain specified coal-fired plants, because it then had extensive coal mines and no significant domestic oil production. The predecessor designs, which included the Northeast Coast, Open Shelter Deck Steamer, were based on a simple ship originally produced in Sunderland by J.L. Thompson & Sons based on a 1939 design for a simple tramp steamer, which was cheap to build and cheap to run (see Silver Line). Examples include the SS Dorington Court built in 1939. The order specified an 18-inch (0.46 m) increase in draft to boost displacement by 800 long tons (810 t) to 10,100 long tons (10,300 t). The accommodation, bridge, and main engine were located amidships, with a tunnel connecting the main engine shaft to the propeller via a long aft extension. The first Ocean-class ship, SS Ocean Vanguard, was launched on 16 August 1941. The design was modified by the United States Maritime Commission, in part to increase conformity to American construction practices, but more importantly to make it even quicker and cheaper to build. The US version was designated 'EC2-S-C1': 'EC' for Emergency Cargo, '2' for a ship between 400 and 450 feet (120 and 140 m) long (Load Waterline Length), 'S' for steam engines, and 'C1' for design C1. The new design replaced much riveting, which accounted for one-third of the labor costs, with welding, and had oil-fired boilers. It was adopted as a Merchant Marine Act design, and production awarded to a conglomerate of West Coast engineering and construction companies headed by Henry J. Kaiser known as the Six Companies. Liberty ships were designed to carry 10,000 long tons (10,200 t) of cargo, usually one type per ship, but, during wartime, generally carried loads far exceeding this. On 27 March 1941, the number of lend-lease ships was increased to 200 by the Defense Aid Supplemental Appropriations Act and increased again in April to 306, of which 117 would be Liberty ships. By 1941, the steam turbine was the preferred marine steam engine because of its greater efficiency compared to earlier reciprocating compound steam engines. 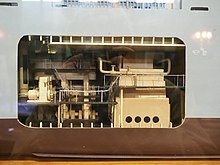 Steam turbine engines required very precise manufacturing techniques and balancing and a complicated reduction gear, however, and the companies capable of manufacturing them already were committed to the large construction program for warships. Therefore, a 140-ton vertical triple expansion compound steam engine of obsolete design was selected to power Liberty ships because it was cheaper and easier to build in the numbers required for the Liberty ship program and because more companies could manufacture it. Eighteen different companies eventually built the engine. It had the additional advantage of ruggedness and simplicity. Parts manufactured by one company were interchangeable with those made by another, and the openness of its design made most of its moving parts easy to see, access, and oil. The engine — 21 feet (6.4 m) long and 19 feet (5.8 m) tall — was designed to operate at 76 rpm and propel a Liberty ship at about 11 knots (20 km/h; 13 mph). The ships are constructed of sections that were welded together. This is similar to the technique used by Palmer's at Jarrow, northeast England, but substitutes welding for riveting. Riveted ships took several months to construct. The work force was newly trained — no one ever previously built welded ships. As America entered the war, the shipbuilding yards employed women, to replace men who were enlisting in the armed forces. The ships initially had a poor public image due to their appearance. In a speech announcing the emergency shipbuilding program President Franklin D. Roosevelt had referred to the ship as "a dreadful looking object", and Time magazine called it an "Ugly Duckling". September 27, 1941, was dubbed Liberty Fleet Day to try to assuage public opinion, as the first 14 "Emergency" vessels were launched that day. The first of these was SS Patrick Henry, launched by President Roosevelt. In remarks at the launch ceremony, FDR cited Patrick Henry's 1775 speech that finished "Give me liberty or give me death". Roosevelt said that this new class of ships would bring liberty to Europe, which gave rise to the name Liberty ship. Aerial photograph of the Liberty ship SS John W. Brown outbound from the United States carrying a large deck cargo after her conversion to a "Limited Capacity Troopship." It probably was taken in the summer of 1943 during her second voyage. The first ships required about 230 days to build (Patrick Henry took 244 days), but the average eventually dropped to 42 days. The record was set by SS Robert E. Peary, which was launched 4 days and 15​1⁄2 hours after the keel was laid, although this publicity stunt was not repeated: in fact much fitting-out and other work remained to be done after the Peary was launched. The ships were made assembly-line style, from prefabricated sections. In 1943, three Liberty ships were completed daily. They were usually named after famous Americans, starting with the signatories of the Declaration of Independence. In the 1940s, 17 of the Liberty Ships were named in honor of outstanding African-Americans. The first, in honor of Booker T. Washington, was christened by Marian Anderson in 1942, and the SS Harriet Tubman, recognizing the only woman on the list, was christened on June 3, 1944. Any group which raised war bonds worth $2 million could propose a name. Most bore the names of deceased people. The only living namesake was Francis J. O'Gara, the purser of the SS Jean Nicolet, who was thought to have been killed in a submarine attack, but, in fact, survived the war in a Japanese prisoner of war camp. Other exceptions to the naming rule were the SS Stage Door Canteen, named for the USO club in New York, and the SS U.S.O., named after the organization itself. Another notable Liberty ship was SS Stephen Hopkins, which sank the German commerce raider Stier in a ship-to-ship gun battle in 1942 and became the first American ship to sink a German surface combatant. Eastine Cowner, a former waitress, at work on the Liberty ship SS George Washington Carver at the Kaiser shipyards, Richmond, California, in 1943. One of a series taken by E. F. Joseph on behalf of the Office of War Information documenting the work of African-Americans in the war effort. The wreck of the SS Richard Montgomery lies off the coast of Kent with 1,500 short tons (1,400 tonnes) of explosives still on board, enough to match a very small yield nuclear weapon should they ever go off. The SS E. A. Bryan detonated with the energy of 2,000 tons of TNT (8,400 GJ) in July 1944 as it was being loaded, killing 320 sailors and civilians in what was called the Port Chicago disaster. Another Liberty ship that exploded was the rechristened SS Grandcamp, which caused the Texas City Disaster on 16 April 1947, killing at least 581 people. 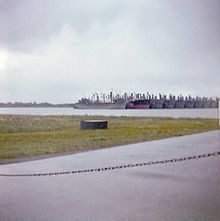 Six Liberty ships were converted at Point Clear, Alabama, by the United States Army Air Force, into floating aircraft repair depots, operated by the Army Transport Service, starting in April 1944. The secret project, dubbed "Project Ivory Soap", provided mobile depot support for B-29 Superfortress bombers and P-51 Mustang fighters based on Guam, Iwo Jima, and Okinawa beginning in December 1944. The six ARU(F)s (Aircraft Repair Unit, Floating), however, were also fitted with landing platforms to accommodate four Sikorsky R-4 helicopters, where they provided medical evacuation of combat casualties in both the Philippine Islands and Okinawa. The last new-build Liberty ship constructed was the SS Albert M. Boe, launched on 26 September 1945 and delivered on 30 October 1945. She was named after the chief engineer of a United States Army freighter who had stayed below decks to shut down his engines after a 13 April 1945 explosion, an act that won him a posthumous Merchant Marine Distinguished Service Medal. In 1950, a "new" liberty ship was constructed by Industriale Maritime SpA, Genoa, Italy by using the bow section of Bert Williams and the stern section of Nathaniel Bacon, both of which had been wrecked. The new ship was named SS Boccadasse, and served until scrapped in 1962. Several designs of mass-produced petroleum tankers were also produced, the most numerous being the T2 tanker series, with about 490 built between 1942 and the end of 1945. Early Liberty ships suffered hull and deck cracks, and a few were lost due to such structural defects. During World War II there were nearly 1,500 instances of significant brittle fractures. Twelve ships, including three of the 2,710 Liberties built, broke in half without warning, including the SS John P. Gaines, which sank on 24 November 1943 with the loss of 10 lives. Suspicion fell on the shipyards, which had often used inexperienced workers and new welding techniques to produce large numbers of ships in great haste. The Ministry of War Transport borrowed the British-built Empire Duke for testing purposes. Constance Tipper of Cambridge University demonstrated that the fractures did not start in the welds themselves, but were due to low temperature embrittlement of the steel used; the same steel used in riveted construction did not have this problem. She discovered that the ships in the North Atlantic were exposed to temperatures that could fall below a critical point at which the steel changed from being ductile to becoming brittle, allowing cracks to start easily. The predominantly welded hull construction allowed small cracks to propagate unimpeded, unlike in a hull made of separate plates riveted together. One common type of crack nucleated at the square corner of a hatch which coincided with a welded seam, both the corner and the weld acting as stress concentrators. Furthermore, the ships were frequently grossly overloaded, increasing stresses, and some of the problems occurred during or after severe storms at sea that would have placed any ship at risk. Minor revisions to the hatches and various reinforcements were applied to the Liberty ships to arrest the cracking problem. The successor Victory ship used the same steel, with improved design to reduce potential fatigue. In September 1943 strategic plans and shortage of more suitable hulls required that Liberty ships be pressed into emergency use as troop transports with about 225 eventually converted for this purpose. The first general conversions were hastily undertaken by the War Shipping Administration (WSA) so that the ships could join convoys on the way to North Africa for Operation Torch. Even earlier the Southwest Pacific Area command's U.S. Army Services of Supply had converted at least one, William Ellery Channing, in Australia into an assault troop carrier with landing craft (LCIs and LCVs) and troops with the ship being reconverted for cargo after the Navy was given exclusive responsibility for amphibious assault operations. Others in the Southwest Pacific were turned into makeshift troop transports for New Guinea operations by installing field kitchens on deck, latrines aft between #4 and #5 hatches flushed by hoses attached to fire hydrants and about 900 troops sleeping on deck or in 'tween deck spaces. While most of the Liberties converted were intended to carry no more than 550 troops, thirty-three were converted to transport 1,600 on shorter voyages from mainland U.S. ports to Alaska, Hawaii and the Caribbean. The issue of hull cracks caused concern with the United States Coast Guard, which recommended that Liberty ships be withdrawn from troop carrying in February 1944 although military commitments required their continued use. The more direct problem was the general unsuitability of the ships as troop transports, particularly with the hasty conversions in 1943, that generated considerable complaints regarding poor mess, food and water storage, sanitation, heating / ventilation and a lack of medical facilities. After the Allied victory in North Africa, about 250 Libertys were engaged in transporting prisoners of war to the United States. By November 1943 the Army's Chief of Transportation, Maj. Gen. Charles P. Gross, and WSA, whose agents operated the ships, reached agreement on improvements, but operational requirements forced an increase of the maximum number of troops transported in a Liberty from 350 to 500. The increase in production of more suitable vessels did allow for returning the hastily converted Liberty ships to cargo-only operations by May 1944. Despite complaints, reservations, Navy requesting its personnel not travel aboard Liberty troopers and even Senate comment, the military necessities required use of the ships. The number of troops was increased to 550 on 200 Liberty ships for redeployment to the Pacific. The need for the troopship conversions persisted into the immediate postwar period in order to return troops from overseas as quickly as possible. On 27 September 1942 the SS Stephen Hopkins was the first (and only) US merchant ship to sink a German surface combatant during the war. Ordered to stop, Stephen Hopkins refused to surrender, the heavily armed German commerce raider Stier and her tender Tannenfels with one machine gun opened fire. Although greatly outgunned, the crew of Stephen Hopkins fought back, replacing the Armed Guard crew of the ship's lone 4-inch (100 mm) gun with volunteers as they fell. The fight was short, and both ships were wrecks. On 10 March 1943 the SS Lawton B. Evans became the only ship ever to survive an attack by the German submarine U-221. The following year from 22 to 30 January 1944, the Lawton B. Evans was involved in the Battle of Anzio in Italy. It was under repeated bombardment from shore batteries and aircraft throughout an eight-day period. It endured a prolonged barrage of shrapnel, machine-gun fire and bombs. The gun crew fought back with shellfire and shot down five German planes, contributing to the success of the landing operations. More than 2,400 Liberty ships survived the war. Of these, 835 made up the postwar cargo fleet. Greek entrepreneurs bought 526 ships and Italians bought 98. Shipping magnates like John Fredriksen, John Theodoracopoulos, Aristotle Onassis, Stavros Niarchos, Stavros George Livanos, the Goulandris brothers, and the Andreadis, Tsavliris, Achille Lauro, Grimaldi and Bottiglieri families were known to have started their fleets by buying Liberty ships. Andrea Corrado, the dominant Italian shipping magnate at the time, and leader of the Italian shipping delegation, rebuilt his fleet under the programme. Weyerhaeuser operated a fleet of six Liberty Ships (which were later extensively refurbished and modernized) carrying lumber, newsprint, and general cargo for years after the end of the war. The term "Liberty-size cargo" for 10,000 long tons (10,200 t) may still be heard in the shipping business. Some Liberty ships were lost after the war to naval mines that were inadequately cleared. Pierre Gibault was scrapped after hitting a mine in a previously cleared area off the Greek island of Kythira in June 1945, and the same month saw Colin P. Kelly Jnr take mortal damage from a mine hit off the Belgian port of Ostend. In August 1945, William J. Palmer was carrying horses from New York to Trieste when she rolled over and sank 15 minutes after hitting a mine a few miles from destination. All crew members, and six horses were saved. 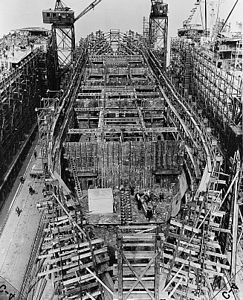 Nathaniel Bacon ran into a minefield off Civitavecchia, Italy in December 1945, caught fire, was beached, and broke in two; the larger section was welded onto another Liberty half hull to make a new ship 30 feet longer, named Boccadasse. As late as December 1947, Robert Dale Owen, renamed Kalliopi and sailing under the Greek flag, broke in three and sank in the northern Adriatic Sea after hitting a mine. Other Liberty ships lost postwar to mines include John Woolman, Calvin Coolidge, Cyrus Adler, and Lord Delaware. Between 1955 and 1959, 16 former Liberty ships were repurchased by the United States Navy and converted to the Guardian-class radar picket ships for the Atlantic and Pacific Barrier. In the 1960s, three Liberty ships and two Victory ships were reactivated and converted to technical research ships with the hull classification symbol AGTR (auxiliary, technical research) and used to gather electronic intelligence and for radar picket duties by the United States Navy. The Liberty ships SS Samuel R. Aitken became USS Oxford (AGTR-1), SS Robert W. Hart became USS Georgetown (AGTR-2), SS J. Howland Gardner became USS Jamestown (AGTR-3) with the Victory ships being SS Iran Victory which became USS Belmont (AGTR-4) and SS Simmons Victory becoming USS Liberty (AGTR-5). All of these ships were decommissioned and struck from the Naval Vessel Register in 1969 and 1970. USS Liberty (AGTR-5) was a Belmont-class technical research ship (electronic spy ship) that was attacked by Israel Defense Forces during the 1967 Six-Day War. She was built and served in World War II as SS Simmons Victory, as a Victory cargo ship. From 1946 to 1963 the Pacific Ready Reserve Fleet - Columbia River Group, retained as many as 500 ships. In 1946 liberty ships were mothballed in the Hudson River Reserve Fleet near Tarrytown, New York. At its peak in 1965 189 hulls were stored there. The last two were sold for scrap to Spain in 1971 and the reserve permanently shut down. 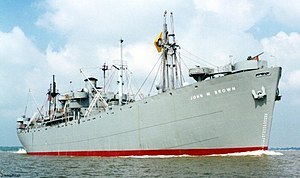 Only two operational Liberty ships, SS John W. Brown and SS Jeremiah O'Brien, remain. Brown has had a long career as a school ship and many internal modifications, while O'Brien remains largely in her original condition. Both are museum ships that still put out to sea regularly. In 1994, O'Brien steamed from San Francisco to England and France for the 50th anniversary of D-Day, the only large ship from the original Operation Overlord fleet to participate in the anniversary. In 2008, SS Arthur M. Huddell, a ship converted in 1944 into a pipe transport to support Operation Pluto, was transferred to Greece and converted to a floating museum dedicated to the history of the Greek merchant marine; although missing major components were restored this ship is no longer operational. Liberty ships continue to serve in a "less than whole" function many decades after their launching. In Portland, Oregon, the hulls of Richard Henry Dana and Jane Addams serve as the basis of floating docks. SS Albert M. Boe survives as the Star of Kodiak, a landlocked cannery, in Kodiak Harbor at 57°47′12″N 152°24′18″W﻿ / ﻿57.78667°N 152.40500°W﻿ / 57.78667; -152.40500. SS Charles H. Cugle was converted into MH-1A (otherwise known as USS Sturgis). MH-1A was a floating nuclear power plant and the first ever built. MH-1A was used to generate electricity at the Panama Canal Zone from 1968–1975. She was also used as a fresh water generating plant. She is anchored in the James River Reserve Fleet. 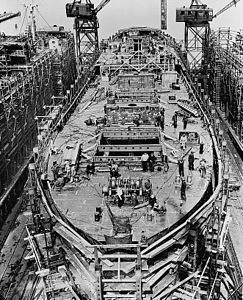 Fifty-eight Liberty ships were lengthened by 70 feet (21 m) starting in 1958. This gave the ships an additional 640 long tons (650 t) of carrying capacity at a small additional cost. The bridges of most of these were also enclosed in the mid-1960s in accordance with a design by naval architect Ion Livas. In the 1950s, the Maritime Administration instituted the Liberty Ship Conversion and Engine Improvement Program, which had a goal to increase the speed of Liberty ships to 15 knots (28 km/h; 17 mph), making them competitive with more modern designs, as well as gaining experience with alternate propulsion systems. Four ships were converted in the $11 million program. The SS Benjamin Chew had its existing condensers modified and a new superheater and geared turbine installed to give the ship 6,000 shp, up from 2,500. The SS Thomas Nelson had its bow lengthened, diesel engines installed in place of the original steam engine, and movable cranes outfitted in place of the original cargo handling gear. The GTS (Gas Turbine Ship) John Sergeant had its bow extended, and its steam engine replaced with a General Electric gas turbine of 6,600 shp, connected to a reversible pitch propeller via reduction gearing. John Sergeant was considered overall to be a success, but problems with the reversible pitch propeller ended its trial after 3 years. The GTS William Patterson had its bow extended and its steam engine replaced with 6 General Electric GE-14 free-piston gas generators, connected to two reversible turbines and capable of 6,000 shp total. William Patterson was considered to be a failure as reliability was poor and the scalability of the design was poor. All four vessels were fueled with Bunker C fuel oil, though John Sergeant required a quality of fuel available at limited ports and also required further treatment to reduce contaminants. Three were scrapped in 1971 or 1972 and the diesel-equipped Thomas Nelson was scrapped in 1981. 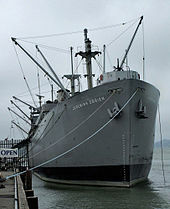 In 2011, the United States Postal Service issued a postage stamp featuring the Liberty ship as part of a set on the U.S. Merchant Marine. New England Shipbuilding Corporation, South Portland, Maine The East and West Yards were both on the same 60 acres (240,000 m2) of shipyard. However, the two yards commenced operations under different titles and until early 1942 were separated by rigid legal conditions. There are four surviving Liberty Ships. SS Arthur M. Huddell—transferred to Greece in 2008 and renamed Hellas Liberty. Restored for use as a maritime museum in Piraeus harbor, Greece. SS Albert M. Boe—The last liberty ship built, sold to private ownership in 1964 and renamed Star of Kodiak. Used as a fish cannery ship. She is currently landlocked but remains the headquarters of Trident Seafoods in Kodiak, Alaska. ^ a b Davies, 2004, page 23. ^ "Liberty Ships Design". globalsecurity.org. 2012. Retrieved 7 May 2012. ^ Video: America Reports On Aid To Allies Etc. (1942). Universal Newsreel. 1942. Retrieved 21 February 2012. ^ Live (the program of Project Liberty Ship provided for cruises of the Liberty ship SS John W. Brown, 2013 edition, claims both that the engine weighed 135 tons (p. 10) fully assembled and that it weighed 140 tons (p. 11). ^ Herman, Arthur. Freedom's Forge: How American Business Produced Victory in World War II, pp. 135-6, 178-80, Random House, New York, NY, 2012. ISBN 978-1-4000-6964-4. ^ "African-Americans in the U.S. Merchant Marine and U.S. Maritime Service". ^ "SS Albert M. Boe". history.navy.mil. 2004. Archived from the original on 7 October 2012. Retrieved 7 May 2012. ^ "Liberty Ships - B". Mariners. Retrieved 6 January 2012. ^ "Liberty Ships - N - O". Mariners. Retrieved 6 January 2012. ^ X-FEM for Crack Propagation - Introduction Article which includes clear photograph of a ship broken in half. ^ Hedley-Whyte, John; Milamed, Debra R. "Asbestos and Ship-Building: Fatal Consequences". Ulster Medical Journal. Ulster Medical Society (September 2008): 191–200. PMC 2604477. PMID 18956802. ^ KOBAYASHI, Hideo. "Case Details > Brittle fracture of Liberty Ships". Sozogaku.com. Retrieved 28 October 2016. Article discussing brittle fracture in great detail. "The brittle fractures that occurred in the Liberty Ships were caused by low notch toughness at low temperature of steel at welded joint, which started at weld cracks or stress concentration points of the structure. External forces or residual stress due to welding progress the fracture. Almost all accidents by brittle fractures occurred in winter (low temperature). In some cases, residual stress is main cause of fracture." ^ a b c d e f g Wardlow, Chester (1956). The Technical Services—The Transportation Corps: Movements, Training, And Supply. United States Army In World War II. Washington, DC: Center Of Military History, United States Army. pp. 145–148. LCCN 55060003. ^ Masterson, Dr. James R. (1949). U. S. Army Transportation In The Southwest Pacific Area 1941-1947. Washington, D. C.: Transportation Unit, Historical Division, Special Staff, U. S. Army. pp. 570–571. ^ Bykofsky, Joseph; Larson, Harold (1990). The Technical Services—The Transportation Corps: Operations Overseas. United States Army In World War II. Washington, DC: Center Of Military History, United States Army. p. 450. LCCN 56060000. ^ a b Wardlow, Chester (1999). The Technical Services—The Transportation Corps: Responsibilities, Organization, And Operations. United States Army In World War II. Washington, DC: Center Of Military History, United States Army. pp. 300–301. LCCN 99490905. ^ Sawyer, L. A. and Mitchell, W. H. The Liberty Ships: The History of the "Emergency" Type Cargo Ships Constructed in the United States During the Second World War, Second Edition, pp. 13, 141-2, Lloyd's of London Press Ltd., London, England, 1985. ISBN 1-85044-049-2. ^ "Lawton B. Evans (American Steam merchant) - Ships hit by German U-boats during WWII". Gudmundur Helgason uboat.net. Retrieved 30 November 2016. ^ "Pers-68-MH MM/822 62 83" (PDF). Bureau Of Naval Personnel. Retrieved 30 November 2016. ^ The Shipping World and Shipbuilding & Marine Engineering News, 1952, p. 148. ^ a b c Elphick, Peter. Liberty, p. 401. ^ Elphick, Liberty, p. 309. ^ Elphick, Liberty, p. 166. ^ Elphick, Liberty, p. 271. ^ Elphick, Liberty, p. 108. ^ Elphick, Liberty, p. 402. ^ Elphick, Liberty, p. 325. ^ Maritime Administration. "Samuel R. Aitken". Ship History Database. U.S. Department of Transportation, Maritime Administration. Retrieved 1 November 2014. ^ Maritime Administration Vessel Status Card. "Robert W. Hart". Ship History Database. U.S. Department of Transportation, Maritime Administration. Retrieved 1 November 2014. ^ Maritime Administration Vessel Status Card. "J. Howland Gardner". Ship History Database. U.S. Department of Transportation, Maritime Administration. Retrieved 1 November 2014. ^ Maritime Administration Vessel Status Card. "Iran Victory". Ship History Database. U.S. Department of Transportation, Maritime Administration. Retrieved 1 November 2014. ^ Maritime Administration Vessel Status Card. "Simmons Victory". Ship History Database. U.S. Department of Transportation, Maritime Administration. Retrieved 1 November 2014. ^ The Hudson River National Defense Reserve Fleet  "The fleet was at its peak with 189 ships in July of 1965." ^ Walker, Ashley (Historic American Engineering Record) (2009). "Operation "Pluto" - Arthur M. Huddell, James River Reserve Fleet, Newport News, Newport News, VA". Library of Congress Prints and Photographs Division Washington, D.C. 20540. Retrieved 5 October 2014. ^ Adams, Rod (1 November 1995). "Army Nuclear Power Plants". atomicinsights.com. Archived from the original on 15 April 2012. Retrieved 7 May 2012. ^ a b "The Calendar of Modern Shipping". modernshiphistory.com. 26 February 2010. Archived from the original on 26 February 2010. Retrieved 9 June 2014. ^ "Postal Service Salutes U.S. Merchant Marine on Forever Stamps". Press Release. USPS. 28 July 2011. Retrieved 25 May 2012. 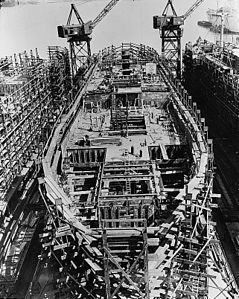 ^ "WWII Construction Records, Private-Sector Shipyards that Built Ships for the U.S. Maritime Commission". Colton Company. Archived from the original on 13 November 2007. Retrieved 1 December 2007. ^ Veasey, Ashley (2009). "Liberty Shipyards: The Role of Savannah and Brunswick in the Allied Victory, 1941-1945". Georgia Historical Quarterly. 93 (2): 159–181. Retrieved 14 February 2018. Davies, James (2004). "Liberty Cargo Ship" (PDF). ww2ships.com. p. 23. Retrieved 25 March 2008. Lane, Frederic Chapin (2001) . Ships for Victory: A History of Shipbuilding under the U.S. Maritime Commission in World War II. Baltimore: Johns Hopkins University Press. ISBN 978-0-8018-6752-1. OCLC 45799004. Sawyer, L. A.; W. H. Mitchell (1970). The Liberty Ships: The history of the "emergency" type cargo ships constructed in the United States during World War II. Cambridge, Maryland: Cornell Maritime Press. ISBN 978-0-87033-152-7. OCLC 132649. Herman, Arthur (2012). Freedom's Forge: How American Business Produced Victory in World War II. New York, NY: Random House. ISBN 978-1-4000-6964-4. Lee, Bill "The Liberty Ships of World War II" An informative 30-page article about the ships, how they were built, and how they were used. Wikimedia Commons has media related to Liberty ships. Liberty Ships and Victory Ships, America's Lifeline in War A lesson on Liberty ships and Victory ships from the National Park Service's Teaching with Historic Places. Ships for Victory: J.A. Jones Construction Company and Liberty Ships in Brunswick, Georgia Eighty-four black-and-white photographs from the J.A. Jones Construction Company collection at the Brunswick-Glynn County Library that depict the company's World War II cargo ship building activities in its Brunswick, Georgia shipyard from 1943 to 1945. Project Liberty Ship – The Shipyards. Summary of Constance Tipper's work—contains remarkable photo of fractured Liberty ship still afloat. Danger presented by the wreck of liberty ship SS Richard Montgomery. Liberty Ships and World War II – A Role Model.